At least there's progress here, and not a complete regression. I felt pretty bold today after what I considered a pretty good 5th set yesterday. So for the fifth set I moved on to a scrap piece of hard maple. This was from a combination of misplaced confidence and a bit of laziness in not wanting to cut the dovetail joint off the poplar scraps. Successes first. 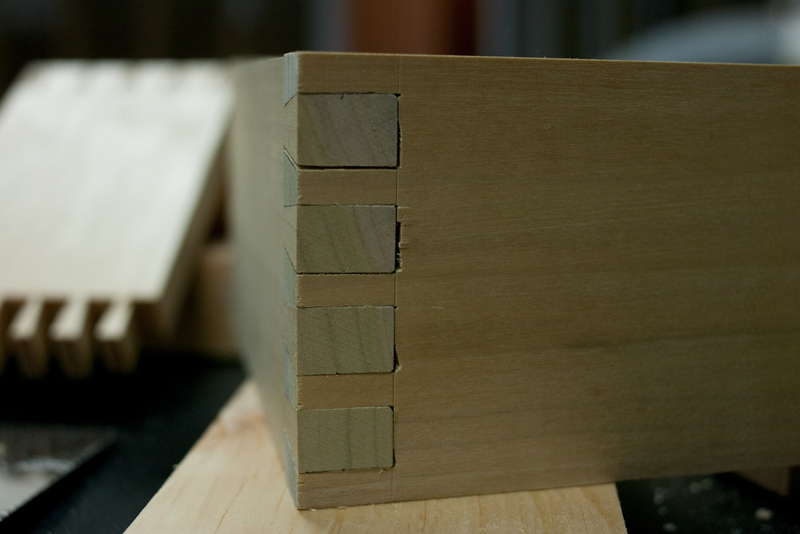 Here's the dovetail from yesterday. One unsightly gap, and the one side seems to be out wide a bit. I'm not sure at this point what to attribute that to since the both sides were cut from the same piece of poplar, so they began the same width. The opposite side is flush and is parallel. The end cuts were over the baseline again, but I think I have that solved on today's set. The horrific coping job is apparent in the second shot. I did some things today to try and keep from wreaking havoc with the coping saw. Some of it was necessitated by what is ridiculously hard maple. So my maple scraps were a bit narrower than the poplar pieces I was working with. 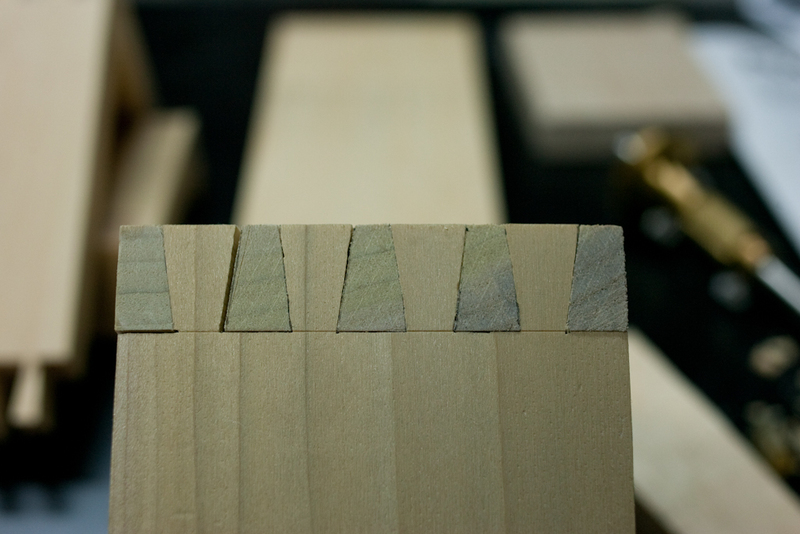 Also, I thought it might be a nice time to try out my other dovetail marking guide. Put those two things together, and I ended up with the problem below. I felt pretty good after cutting the tails. I thought I did a pretty reasonable job sawing. I managed to chisel out the waste without going below the baseline, except on one. Although it was a bit out of perpendicular to the face, so I think I could've placed it on the interior of the joint, out of sight. I noticed that the way I start the saw kerf chipped a couple of the tails, so I'll have to keep an eye on that in the future. After all this, the problem hit me smack in the face as I finished laying out and sawing the pins. 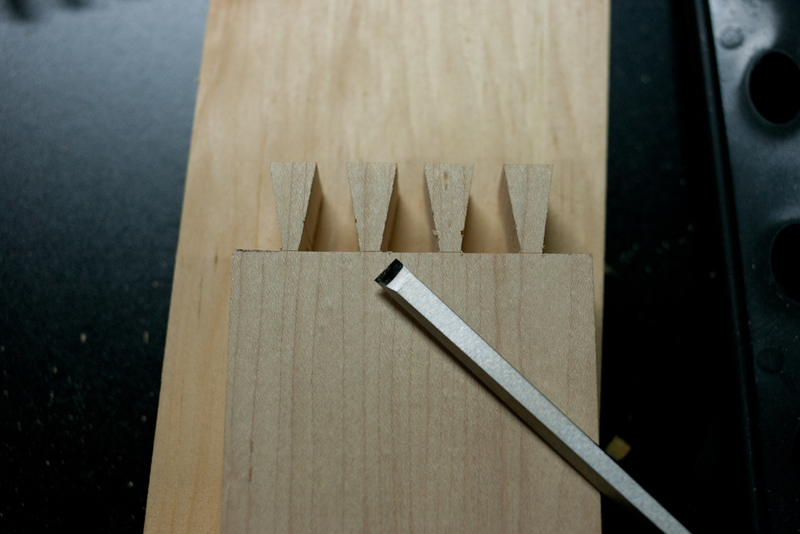 I can't chisel out the waste on the pin board since my narrowest chisel is 1/4". Nicely demonstrated below by my chisel and the bottom of the tail. Measure twice, cut once? When one doesn't measure, I suppose the inference is that the layout should be checked twice.